The next generation of urban Lighting Designers will work in cities that are smarter and more integrated than ever before. But the sheer speed of development in LED-technology risks putting the technology in the driving seat of the future Smart Cities, rather than the human centric lighting design. We met Tina Wikström, student at Jönköping University, and asked for her perspective on it. I’m studying Lighting Design, a three year Bachelor program, which covers both daylight and artificial light. Can education keep up with the current pace of development across the industry? I feel that the technological development is moving faster than what the program can keep up with. Students who wants to properly stay up to date have to have a genuine interest for lighting and technology. What does the school teach about LED, with all its pros & cons? The school teaches both pros and cons. For example that LED is energy efficient, has a longer life span and that LED provides opportunities for other/new solutions due to its smaller size. But also negative aspects such as problems surrounding manufacturing and recycling of LED, and glare. The current focus on energy efficiency also risks putting the actual quality of light in the shade. In your view, is the good lighting design/the lighting designer, at all threatened by the ongoing LED-revolution? Absolutely not. Our task, as lighting designer, is in my view to create good light for humans, regardless of technology. I can’t imagine a shift in technology making lighting less important, rather the opposite – that the lighting designer’s position and role will become even more important. Partly because lighting is getting more complicated and complex, therefore requiring the competencies of a lighting designer in order to apply technology in the best way. How do you see your role, as a future lighting designer, is best used in the context of Smart Cities? I still see my future role as one of creating good light for humans. Lighting and Smart City solutions is a big industry with a lot of focus on technology. My role will be to ask the question ‘why’, so that we don’t forget for whom the environment was created for and what its purpose was. It might sound critical, but I think it’s important to not forget the purpose of my role as a lighting designer, in this ocean of smart technological solutions. Finally, what makes urban lighting design so exciting? I think it’s exciting because you get to work in large scales , and creating environments with the goal to make life better and more enjoyable for humans. I work towards creating environments that promote human health and livability, regardless of whether it’s interior or exterior. This is is why it’s especially exciting with urban lighting design, because you work in environments shared by many people, with the goal to make it better utilized and more livable . 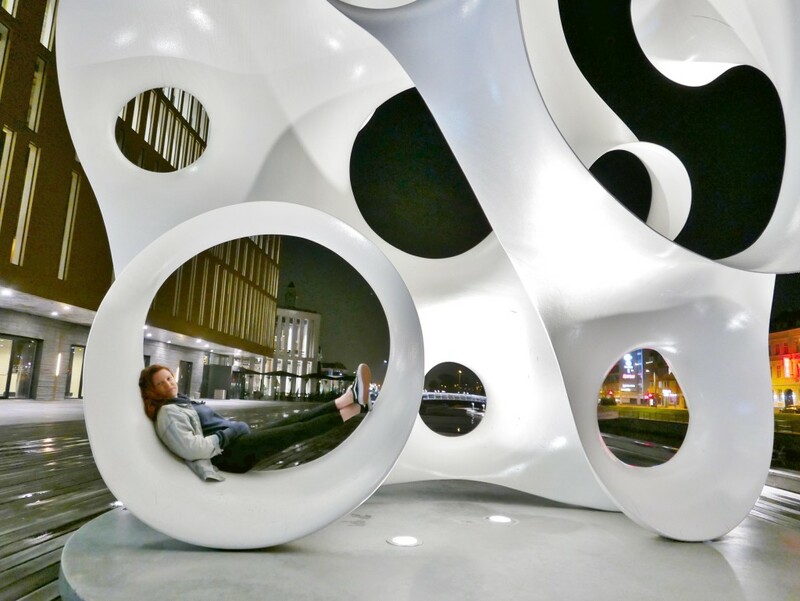 Tina Wikström, resting inside Rubato, by Eva Hild, in Malmö. (Photo by Tina). Tina currently works at the Streets & Parks department, in the City of Malmö, over the Summer before resuming her studies at the university. This also provides her with the opportunity to work together with Johan Moritz, one of Europe’s few urban Lighting Designers employed by a municipality.